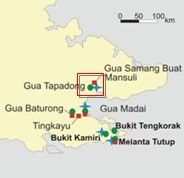 In the Mansuli Valley of eastern Sabah, 30 Km from the Lahad Datu township, another of Malaysia’s archaeological sites has revealed the earliest evidence of an important centre of human habitation, dating back 235,000 years. It is though to be the oldest Palaeolithic site in the Borneo Archipelago, though was discovered by chance, in 2003, when an archaeological team was making its way to an archaeological site at Gua Samang Buat. About 1 km from the cave they came across stone tools on the ground. Excavation of the site produced more than 1,000 stone tools and evidence of a stone tool workshop of the Palaeolithic period, using mainly chert - a fine grained silica rich sedimentary rock, found in the region.